Build Republic | Design Studio | Hong Kong — If I ever talk like this, punch me! If I ever talk like this, punch me! "The brand level imagery visualises the forever brand message through a sense of time and captured personal moments"
A friend of mine shared this on facebook and I thought it was hilarious and insightful at the same time. When designers start explaining their work like this, you know there are no real innovation or substance with the work. 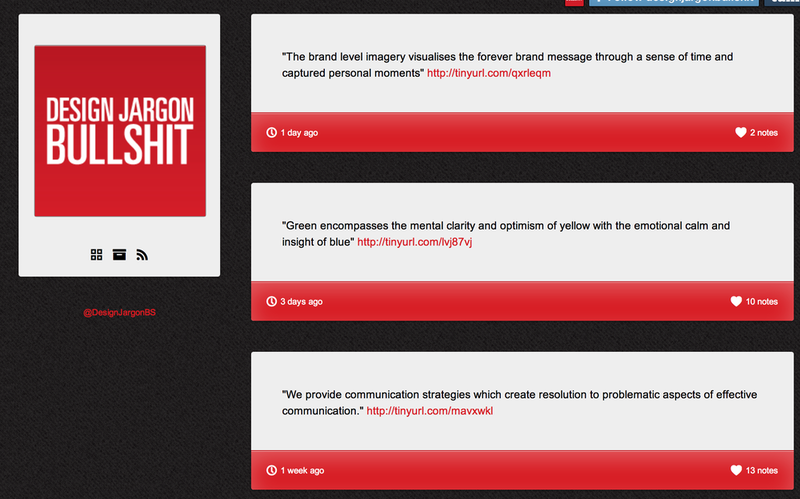 Interestingly, most of the quotes are from branding identity projects. This either shows that brand identity is really difficult to nail down or designers shouldn't pose as marketing consultants. Perhaps designers should simply focus on graphic solutions and businesses should focus more time on identifying the brand values and how the brand can make an authentic connection with its customer. Design Review: How Misfit Wearables designed a user-centric packaging by using digital marketing.